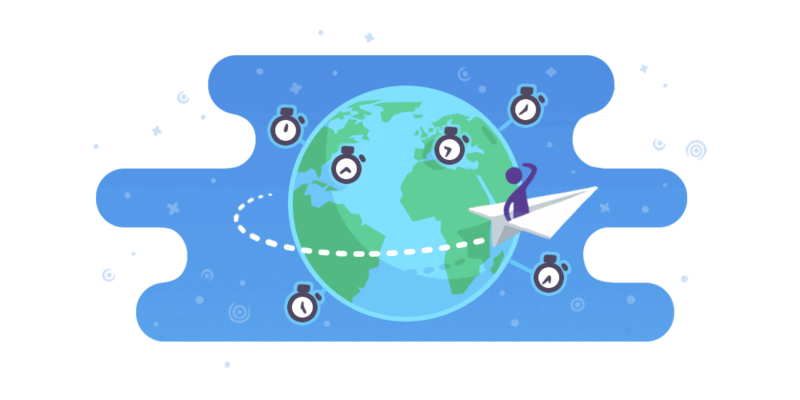 More and more businesses and teams lean in favor of working across time zones, but engineering the success of remote teams is a balancing act. Managing a team working across time zones conjures up chilling imagines: missed meetings, botched communication, teammates in Asia staying up late to chat to a Californian having his morning coffee. We know the feeling of burnt out disorientation that results from travelling over multiple time zones. Your circadian rhythm is out of whack, daylight no longer makes sense, you struggle to honor any engagement that doesn’t involve going to bed. Now imagine that on the scale of a whole business. Luckily, there are ways to pull off working across time zones, and many compelling reasons to try. According to a Gallup Study, the number of remote workers has been steadily increasing for the last twenty years, especially so in the last five. Working remotely requires discipline, but remote workers report a host of benefits. But what incentives do businesses have for having their workforce scattered across the globe? Be more available: for customer-facing businesses, having people working across time zones means that there will always be someone on call to solve an issue or take an order. Lowered costs: remote workers don’t require the infrastructural and material expenses of onsite office workers. Happier workers: PGI explains that 69% of remote employees report lower stress levels, and 80% report better morale. Wider talent pool: when geography is no object, a business has a wider pool of qualified applicants from which to choose. More flexibility: a remote team can scale easily, react quickly, and have the tools to be efficient from anywhere. Greener: without the supplies and energy needed to run a physical office (not to mention commuting), teams working across time zones have a lighter carbon footprint. That’s it in a nutshell. There are many advantages to having a partially or fully delocalized team. However, managing a successful team spread over different time zones requires proper planning and a sound strategy. In a physical office setting, personalities, idiosyncrasies, and preferences come into play for both productivity and atmosphere. For a team with some remote members, it can be difficult to accommodate people who aren’t in-house. A team solely made up of delocalized employees, it can be even harder to find a rallying point for everyone. Successfully managing a delocalized teams involves coordination skills. Managers need to be aware of constraints as widespread as Daylight Savings Time (which happens at different times worldwide) and individual national holidays. Click to enlarge the cheat sheet! Getting organized means working to oblige people no matter the spot from where they work. It might sometimes feel like herding cats, but managerial discipline and thoughtfulness are necessary to keep a team from falling apart when working across time zones. The fact that your team is dispersed all over the world means that you must pay special attention to keep it working as a cohesive unit. It will take greater effort than if everyone worked in the same building, but it isn’t impossible. Setting a home-time zone is important. It’s especially handy if it works out being the time zone which houses the majority of your team, but that may not be the case. Then, build on the home-time zone and overlap the rest of your team onto it. This may be tricky, but think of it as a system of checks and balances: if the Asian team absolutely must stay up late for certain meetings, schedule that meeting at a fixed, planned date, and let people get a late start the next day. It’s not easy to admit, but time zone discrepancies will affect work repartition and scheduling. However, ideally, this influence will stay minimal, thanks to defined processes and organization. Setting some clear ground rules might chafe at first, but will act as a safeguard over time. Setting up processes is crucial to the success of your delocalized team, but so is the use of proper business tools. Some tools can help managers and teammates have an easier time of scheduling meetings, booking flights, planning calls, etc. Every Time Zone (know the hour everywhere in the world) and World Time Buddy (works best for people working outside of major cities) are here for you. Keeping track of GMT, UTC, and the like is a headache, especially if no one really knows for sure when Australia jumps ahead an hour. Delocalized teams require means of communication both asynchronous and in real-time. The latter is especially true for teams working across time zones. Real-time communication is needed for meetings and smaller group chats. Video chat programs (appear.in, Zoom, Google Hangouts) or messaging services (like the ubiquitous Slack) will cover your real-time needs. However, sometimes it’ll just be impossible to schedule a face-to-face to suit everybody. Making people take a 3am call might be less worthwhile (no one’s at their productive best at 3am, anyway) than turning to an asynchronous means of communication. Tools like Google Docs, Trello, and Hackpad allow teammates to collaborate on a project at their own pace. In the long run, this is a way for scattered teammates to participate in group projects no matter their time zone. Asynchronous collaboration doesn’t just happen through communication. Passing along information, completing tasks, and monitoring performance are part of the smooth running of any team. Some tools can take over those tasks for remote teams and make them just as simple as in a physical office, minus the distractions. Dropbox lets teammates store and share documents with each other, and toggle privacy setting for better organization and compartmentalisation. Asana allows managers to assign and comment tasks for individual team members in a clear and legible dashboard. Toggl helps workers stay on top of their assignments and tracks the time needed to complete them. Rescue time assists people who work on their own with the time management and task prioritization. Aside from an organized process and appropriate technological tools, the last link in the chain to managing a team working across time zones is the human aspect. Running a remote team calls for particular people skills. Having the right tools and the right orchestration isn’t quite enough to bring delocalized teammates together in a productive meeting. For instance, if only part of the team is remote, the people face-to-face tend to ignore the people on the computer screen. That person’s input tends to be minimized, and that can have adverse effects on cooperation and employee satisfaction in the long run. That’s where managers can step in. Lead by example, and show that no matter a teammate’s location, their insight and reflection has a place at the table. Make the most out of video conferences: don’t multi-task, maintain eye contact, hold up your end of the conversation. If your team is working across time zones, acknowledge their circumstances, make everyone feel equitably part of the team. A sound organization is necessary to a dispersed team working like a well-oiled machine. However, that organization cannot be immutable. Occasions will arise which will require a last-minute change of plans. That can be a challenge for teams working across time zones. Nothing can be perfect at all times, so it’s important to have a contingency plan, and to make room for bumps in the road. Implementing a rotating schedule for your fixed time-zone is a way to shake up your organization and try to improve it. Every year, every few months, change your home-time zone. This will let employees in one part of the world experience a different schedule, and you might even find that it works better for everyone. Even if your whole team is dispersed all over the world, it’s worthwhile to plan for a time when everyone will be in the same place. This will help newcomers integrate, enrich the company culture, and cultivate long-lasting bonds between teammates. Of course, this type of gathering is an investment, but it’s worth the improvement to your team’s cohesion and morale. Managing a team across time zones requires a light touch. It isn’t a good use of anyone’s time to micro-manage, and will cut into everyone’s productivity. If the employees hired, no matter their time zone, are carefully selected, adequately trained, and sufficiently empowered, then they won’t need to be micro-managed. Remote employees are shown to communicate with their supervisors at a rate comparable to office employees. There is at least one big difference, however. Since everyone’s not stopping to chat at everyone’s desk, each instance of communication is more targeted and more worthwhile. Being part of a team working across time zones calls for empowered self-determination. But it also requires available management and qualitative exchanges. A tall order for sure. Setting high standards for yourself and your team is key to your success, regardless of its setup, but is even more important for delocalized and scattered teams. Did you know that Aircall’s virtual phone system has people working across different time zones in mind?